Children attend class in a newly repaired school in Diyarbakır’s Sur district, Feb.4, 2019. Turkey's southeastern province of Diyarbakır continues to heal as schools that were heavily damaged by PKK terrorist attacks have been restored and are ready to host students. It's been three years since the schools in Diyarbakır's Sur district stopped functioning due to damages caused by PKK terrorist attacks, causing the suffering and displacement of 4,500 students. Today, the district has been cleared of terrorists and with functioning schools once again, thousands of students eagerly anticipate their return to the classrooms. "We've lost our houses and schools. We were guests at another school and were not feeling comfortable. After three years, we've returned to our school," said student Beyza Rollas to Anadolu Agency expressing her happiness and appreciation for the Turkish government. She added that previously, when there were still terrorist elements in the district, they had many troubles since they had to wake up with the sounds of bombs and weapons. The southeastern districts of Cizre, Sur, Silopi, Nusaybin and several other districts received a lot of damage when the PKK terrorist organization exploited the cease-fire period between 2012 and 2015, dug ditches, trenches and forcibly recruited locals for terrorist activities in the districts. One of those devastated areas, Sur, a historical district of the southeastern Diyarbakır province, has been completely renovated in three years with new projects valued at around TL 2 billion. It's been three years since the schools in Diyarbakır's Sur district stopped functioning due to damage caused by PKK terrorist attacks, which resulted in the suffering and displacement of 4,500 students. In March 2016, anti-terror operations in Sur district came to an end as the region was cleared of PKK terrorists. However, although the city had its peace back, the damage from the conflict was significant with major demographic changes as buildings were destroyed and people forced to leave. Today, the city is set to rise from its ashes as reconstruction work continues with several plans for the terror-stricken people to get their homes back. Sultan Mercan, a middle school student, said three years ago, she could not come to the school due to the terrorist attacks and had to move to another school. "When I was coming to school, I was confronted with the terrorists a few times. Since then, I couldn't come to my school. However, now, thank God we are here at our school and happy," she said. "I'm happy as if I've returned to my home," said Melisa Günay Kuday, a high school student. Visiting the classrooms to celebrate the reopening of the schools, Abdullah Çiftçi, the district mayor, also expressed his enthusiasm over the opening of the schools. happier country in the future," he underlined. "In these streets, we now only want to hear the sound of peace, brotherhood, the unique culture of Diyarbakır and music, not the sound of terrorism," he added. 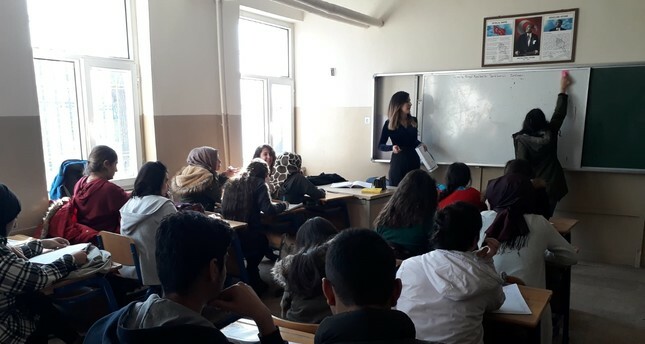 Speaking with the students while distributing stationary to them, Çiftçi also said that not only schools but more than 4,000 houses in the district were also damaged. Despite the success of the anti-terrorism operations, as a result of PKK terrorist attacks, five neighborhoods in Sur were completely destroyed, and the residents were forced to flee, creating a group of terror-stricken people who had suffered and wanted their homes back. For the families who have been victims of terrorist activities, 1,500 traditional Diyarbakır houses have been built in the city center. In total, 5,537 houses have been built for the suffering families and 3,847 workplaces have been rejuvenated. On the other hand, for the families who have suffered due to terrorism and had to leave their houses without taking any possessions with them, a total of TL 90 million rent money and TL 18 million liras of food aid have been provided.